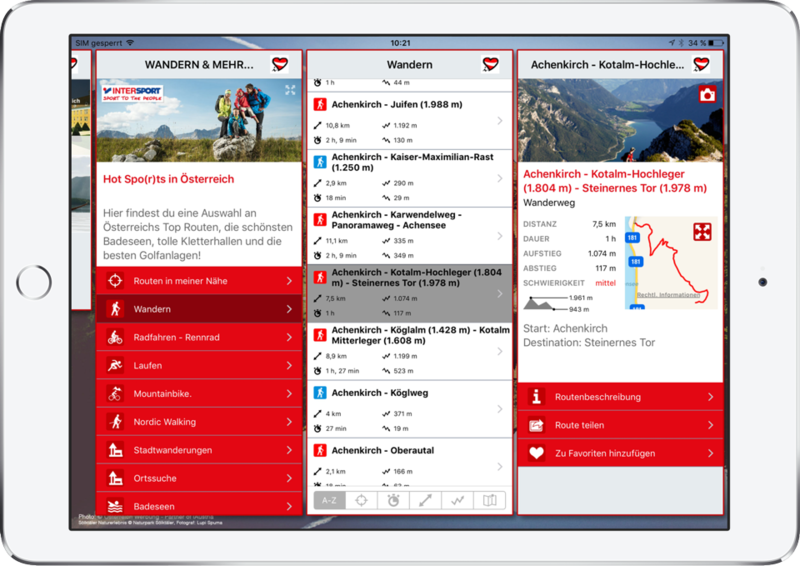 The iOS and Android app for your holiday in Austria. Plan – Arrive – Experience. The iAustria app provides tips and information about your holiday destination beforehand in order to plan your trip. Let's check out some features! With the free event app for Austria, choose from over 200 Austrian festivals or visit one of the world's best museum exhibitions. Experience the diversity of Austria's art and cultural events with the best iOS and Android app for Austrian tourism. Browse Austria's most famous attractions alphabetically, by distance or located on a map. 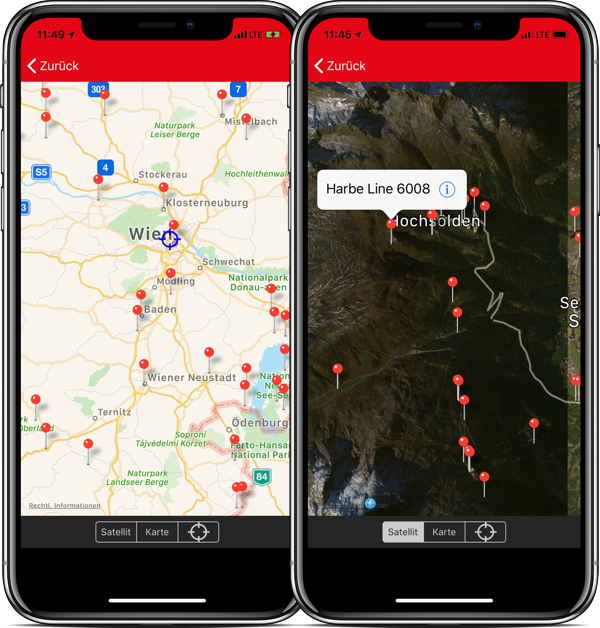 Discover Austria's best cathedrals, architecture, museums, parks, monuments, palaces, castles, zoos, spas and other sights on your iPhone or Android smartphone. 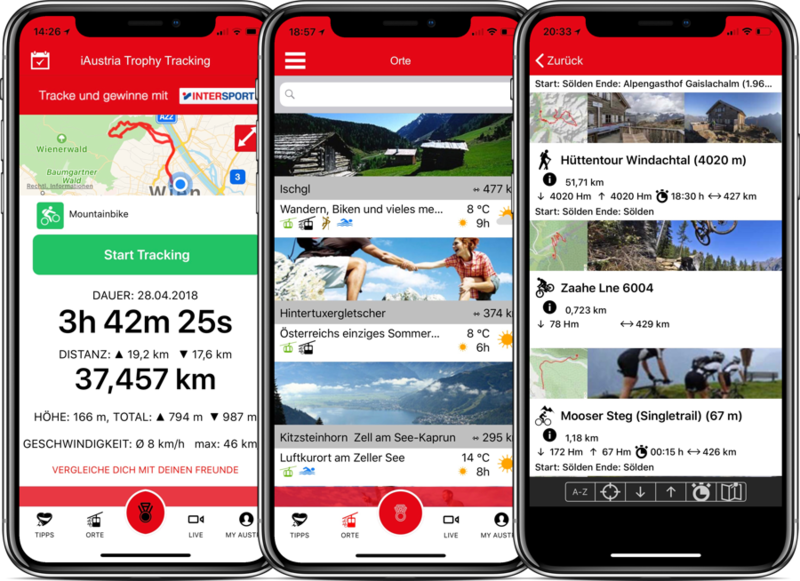 Explore Austria's unbelievable network of hiking, cycling, mountain biking, running and nordic walking trails with the best all-in-one tourism app for smartphones. Search by resort, distance, length, duration, altitude to find the trail right for your discipline and difficulty level. When planning a trip to the mountains, the app offers everything you need. Which cable cars are open? What are the top attractions and trails? Locate the nearest destinations with iAustria. Get detailed information about nearby cities and town including directions, local tourism offices, webcams, weather forecasts, shopping, events and other exciting tips with your iPhone, iPad and Android app. Track your holiday, collect pins and win! From May 2019 it becomes sporty. Whether by mountainbike, cycling, jogging, hiking or walking tour. Start your iA:Tracking Trophy with your friends and win! Collect pins on your iPhone, iPad or Android app and win great prizes! The top iCommunity users in the iAustria Tracking Trophy Challenge. Collect iA:Trophy pins on your iOS and Android app by checking into locations on your app radar. When you reach certain milestones you will be eligible to win prizes. Track your sporting activities and win cool prizes from INTERSPORT! We are giving away 4 bike accessory sets a month (with helmet, backpack and bike lights). For the iAustria Trophy - grand finale in October 2019, there are 4 Genesis Mountain bikes to win! 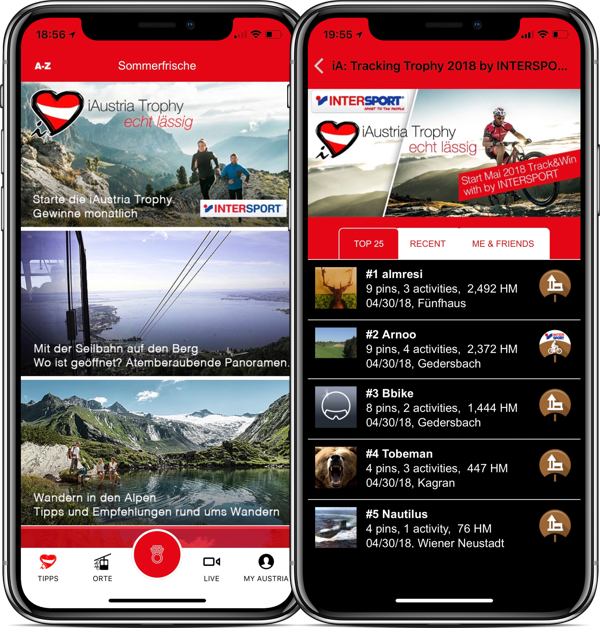 The iAustria app for iOS and Android. Download the free app today and enjoy your holiday in Austria. Dankeschön!